A previously unsuspected tidal dwarf galaxy candidate (upper left) appears only in the ultraviolet, indicating the presence of many hot young stars as seen in this cool space wallpaper. A previously unsuspected tidal dwarf galaxy candidate (upper left) appears only in the ultraviolet, indicating the presence of many hot young stars as seen in this cool space wallpaper. 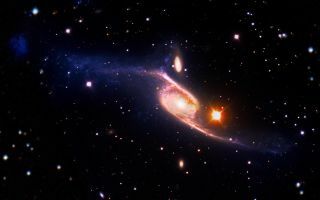 IC 4970, the small disk galaxy interacting with NGC 6872, is located above the spiral's central region. The spiral is 522,000 light-years across from the tip of one outstretched arm to the tip of the other, which makes it about five times the size of our home galaxy, the Milky Way. This image was released Jan. 10, 2013.